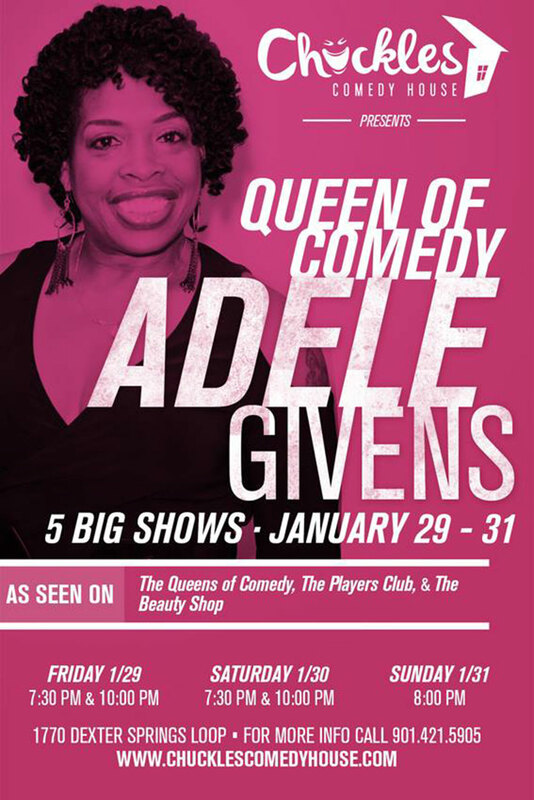 Adele jumpstarted her comedy career with the original installment of Russell Simmons’ “Def Comedy Jam,” “The All-Stars of Def Comedy Jam” and “The Oprah Winfrey Show.” It wasn’t long before she made her acting debut, guest-starring in such sitcoms as “Martin,” “Moesha,” “The Steve Harvey Show,”and “The Parkers.” Adele quickly landed a recurring role on “The Tracy Ullman Show” and in 2001, became a series regular on the hit UPN sitcom “The Hughleys,” playing the wise-cracking sister in-law to D.L. Hughley’s character. Loving her newfound tree, Adele branched out to do her very own morning radio show, “The Howard McGee and Adele Givens Morning Show” on Chicago’s #1 rated WGCI. She also landed her first movie role in “The Players Club” and has gone on to star in hit movies such as “Beauty Shop” with Queen Latifah. She has 2 shows Friday & Saturday. The first show starts at 7:30PM followed by a 10:00PM show. She also has one show Sunday at 8PM.